One of the unique meals I’ve eaten in Barcelona was at the 1* Michelin restaurant, Dos Palillos. 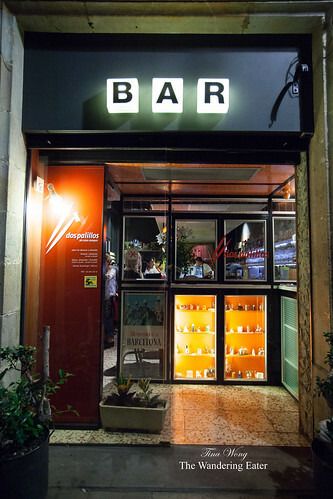 Dos Palillos technically has two locations, one being in Barcelona (where I ate and the original location) and Berlin, Germany. 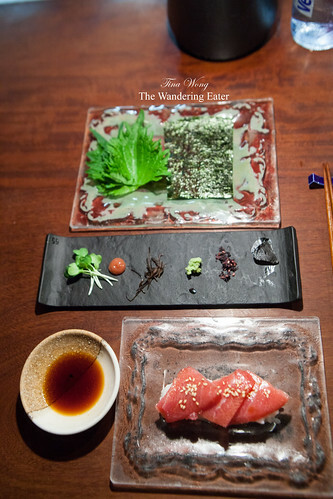 It’s a thoughtful, fusion restaurant merging Asian, mostly Japanese, cuisine with Spanish food sensibilities; not some weird mash-up of cuisines that doesn’t make sense on a plate. The results were mostly good (with a few dishes bringing up my childhood memories) but a few little details that could have made certain dishes excellent. 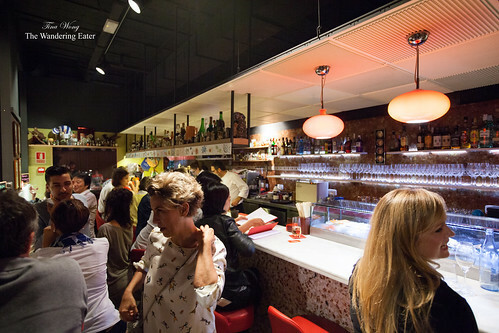 This place is very popular, especially on the Saturday night we dined there — and this is a tasting menu only restaurant (90€) — as diners wait for the next available seats at the crowded bar. 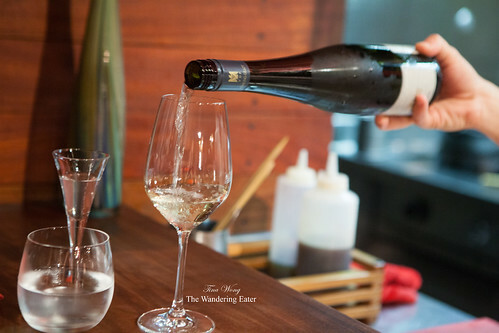 When we pass through the curtain of beads, we’re greeted by a hostess and we informed her of our reservation and quickly whisked off behind the sliding door to the cavernous yet small open kitchen and dining room. 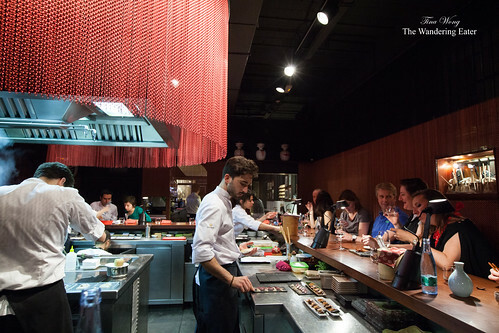 The dining area is set up like a sushi bar, where you have the sights and (slight) sounds of chefs cooking and plating in front of you but you’re sitting in a comfortable chair. When we’re greeted by one of the servers, we all had our welcoming drink of a sweet, clean lychee infused sake. 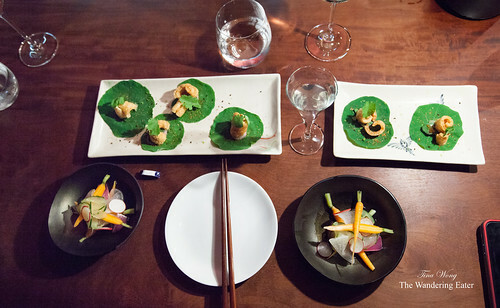 Some dishes were sent out in pairs, like the first two – sweet pickled vegetables and pork cracklings, togarashi, parsley on an herbaceous leaf. The pickles were a colorful mix of baby carrots, daikon, red onion, and turnip. It’s wonderfully crunchy, refreshing, and sweet-sour. 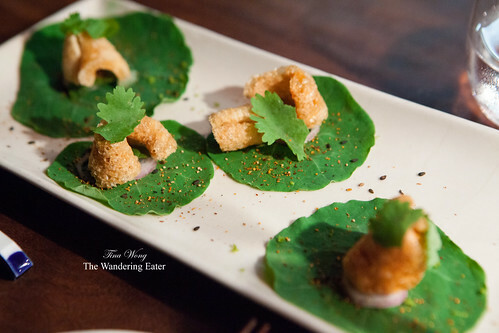 The very crunchy pork cracklings slowly preparing us into the meal but still keeping it on the light side with the herbaceous leaf. 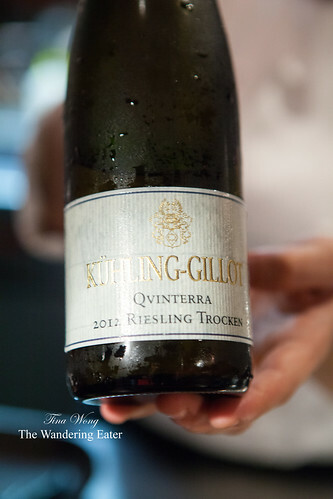 We also ordered glasses of a dry yet fruity Xuhling-Gillot 2012 Riesling “Trocken” (8€ per glass). 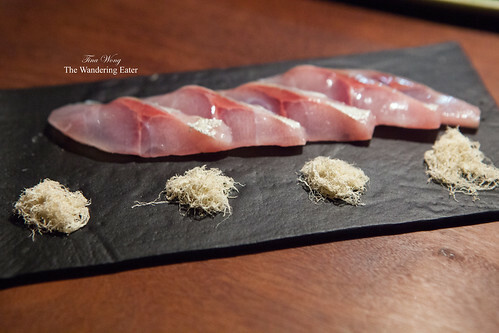 The cured mackerel with dried squid threads was a sashimi like treatment to this tasty, oily fish and the dried squid threads added a subtle saltiness and brought out umami flavors from the mackerel. 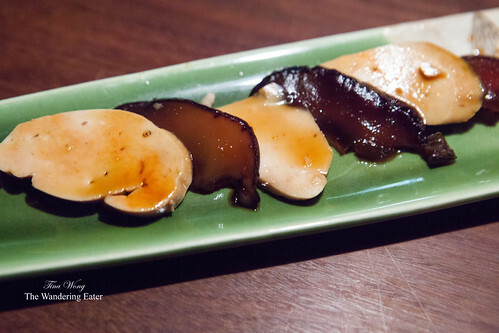 The cured mackerel was served with the slices of silken pressed tofu and shiitake mushrooms glazed in a sweet soy glaze at the same time. We’re blown as to how delicious the tofu was. 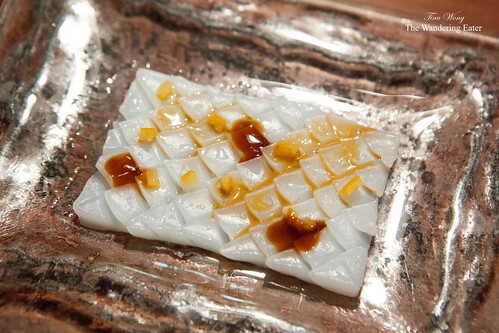 The pressed silken tofu mimicked the texture of the silky mushroom slices and the balance of sweet and salty was perfect. The “sunomono” salad isn’t your traditional sunomono salad. 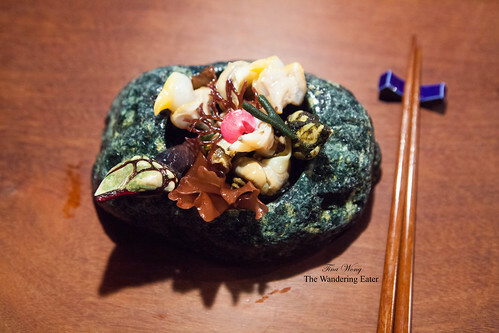 It’s a fresh mollusk salad composed of percebes (gooseneck barnacle), clams, sea snail, kelp and arame seaweed. It’s relatively crunchy mixture of seafood that has clean flavors that’s minimally treated (barely tasted much salt or any extraneous flavors beyond the elements). The next course, briefly seared shrimp with its heads on with black tea oil was almost as close to sashimi for shrimp I’ve eaten. The shrimp was silky and tender. 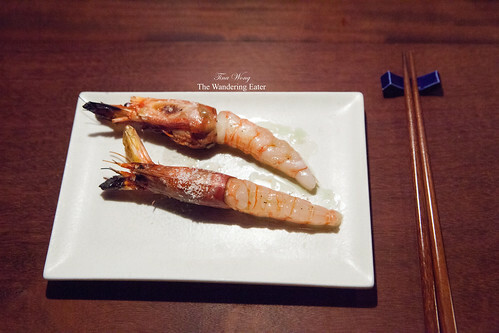 The black tea oil drizzled on top of the shrimp added an subtle but unexpected depth of smokiness to the sweet shrimp. The best part was sucking the salty seared shrimp head. The kimchi de col i calamar (kimchi of cabbage and squid) and sashimi tibio de calamar (sashimi of warm squid) were up next. These duo of squid dishes were good. The squid kimchi tasted fine but my Korean friends thought it was fine. 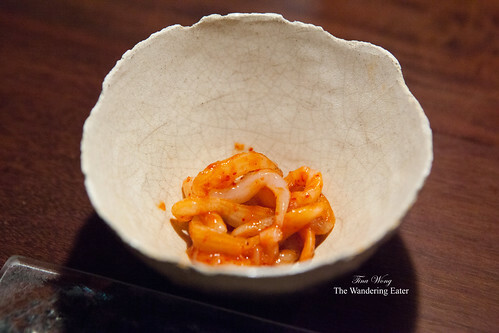 Barely spicy squid and it lacked the funky, fermented flavor we’re all hoping. 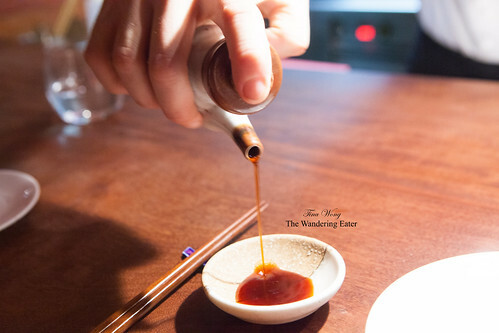 The sashimi of warm squid was briefly torched then drizzled in a lightly salted squid sauce and a touch of grated yuzu on top. This particular treatment I liked a lot. 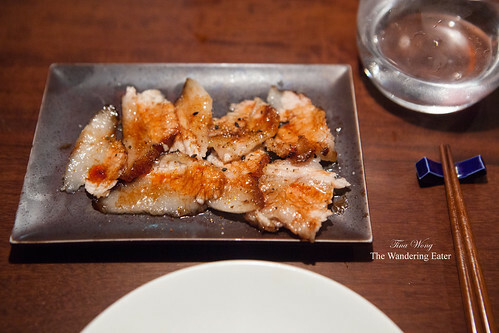 The squid was super tender and the hit of yuzu was perfect. 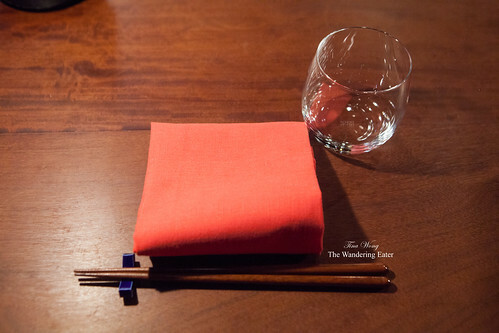 The “Nanbanzuke” is the kitchen’s iteration of the Japanese dish. 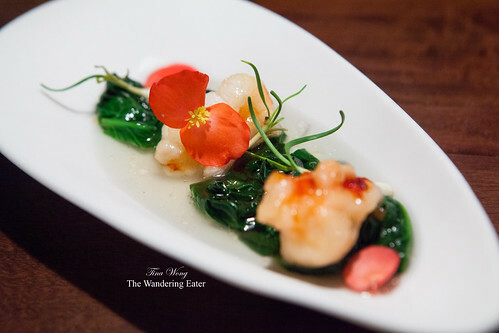 This delicate dish was briefly fried lobster tossed in vinegar and plated with a delicate broth, pea shoots and nasturtium flowers. The flavor profile kind of reminds me of walnut prawns that I used to eat as a kid except of course, not as mayonnaise heavy and without any walnuts. What really stuck out was the zippy, clear broth that lightened up the dish. 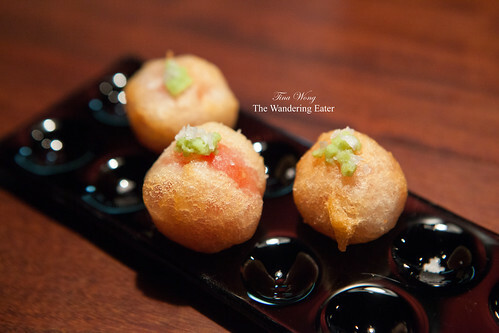 To give our palates a reboot, we’re served up with cherry tomato tempura topped with fresh wasabi and sea salt. Hot, juicy, sweet tomatoes meld wonderfully with the floral and subtly spicy wasabi. 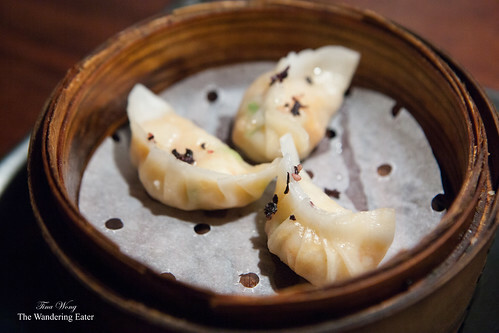 The langoustine and pork belly dumplings with ginger infused soy sauce was a good langoustine dumpling but it’s not really our favorite. My friends and I are dumplings snobs since we’re reared with excellent homemade dumplings and we were looking for that particular chewiness on the skin despite the filling being quite tasty. 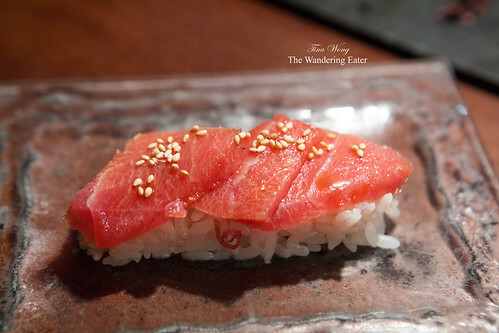 The te maki entretenido de toro (a DIY maki rolls with tuna toro) was the most fun and interactive course of the evening. 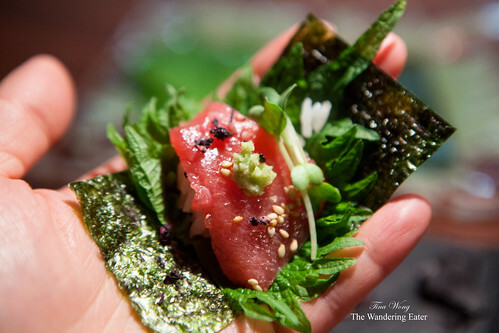 We build and customize our mini toro temakis with various herbs (shiso, pea shoots) and aromatics. Everything was great except the sushi rice’s texture was off (it was on the dry side). The Nippon burger was a cute take of the burger we all know. 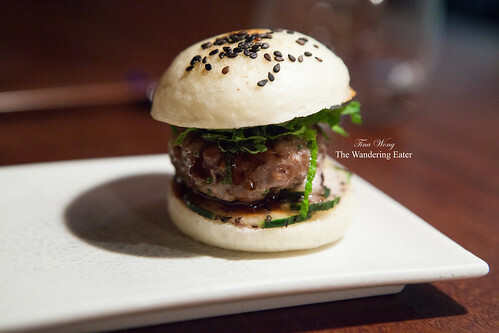 A miniature beef patty was juicy and beefy but it was dominated by the toasted mantou-style bun. 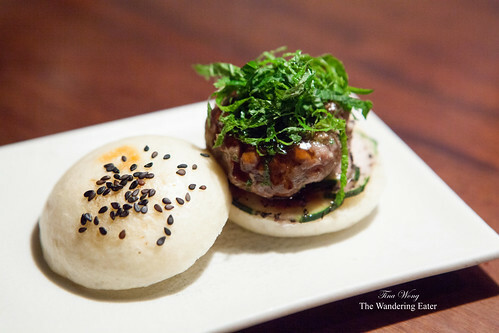 The finely shredded shiso leaves lightened up the beef. The dinner ended its savory portion on a high note. The grilled pork neck collar was probably our favorite meat course because the collar was succulent and unabashedly in it’s fatty glory. 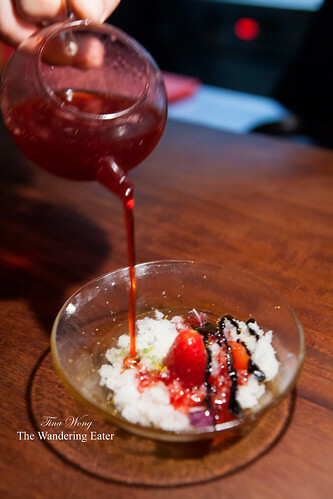 Our first dessert was lychee ice, strawberries, black garlic, shiso, and strawberry sauce; a version of the kakigōri (かき氷). 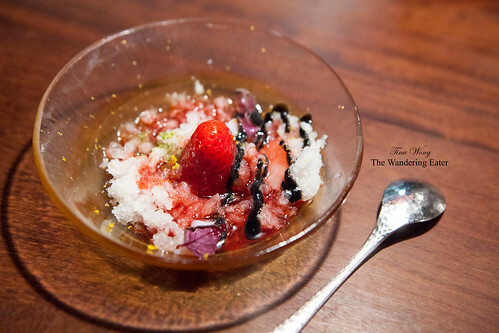 This was an interesting shaved ice concoction beecause of the complex, sweet-salty black garlic sauce and the shiso sort of mimicked the flavor of mint. 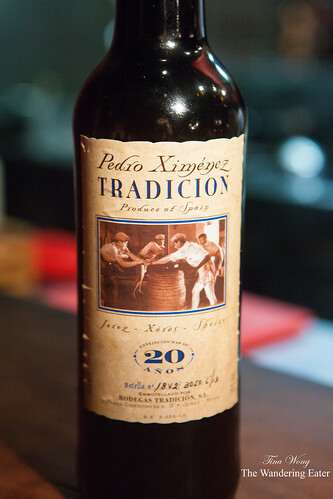 We had a glass of Pedro Ximenez “Bodegas Tradicion” 20 Year-old sherry (12€). 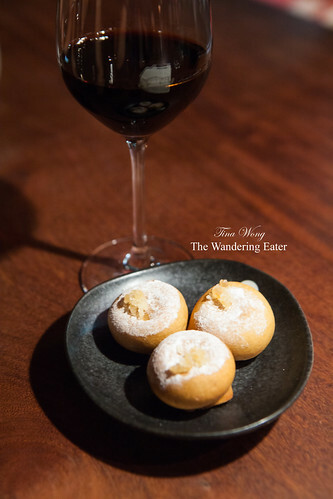 An intense glass of syrupy, chocolate-y with notes of figs and raisins fortified sherry. 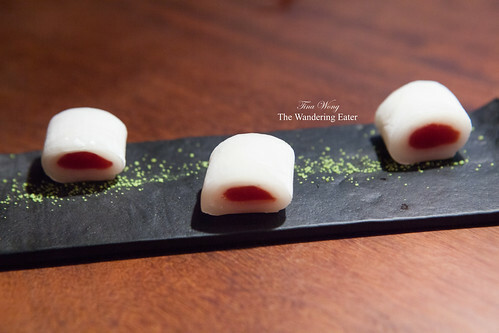 The fresh mochi with strawberry jelly was wonderfully pliant and chewy but I was hoping for a different filling like green tea or even a fig jam. 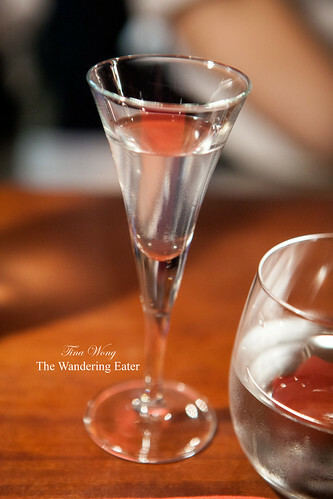 The strawberry jelly had an acidic tang end note that was slightly off-putting for me. The final dessert was the chocolate ningyo-yaki topped with candied ginger. These fluffy cakes were filled with creamy chocolate pastry cream and dusted in powdered sugar. The candied ginger was a smart move to add a touch of heat. 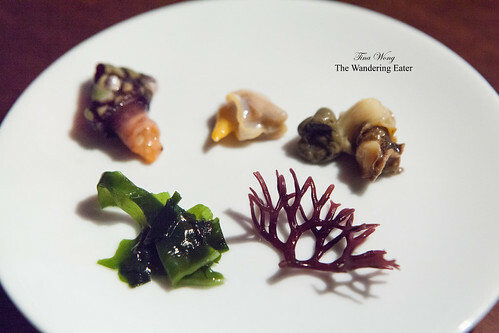 Overall, the tasting menu was thoughtful and the cooking techniques were, for the most part, spot on. If fusion cuisine restaurants created menus like this more often, fusion would not have been a dirty/overused word in the restaurant world. 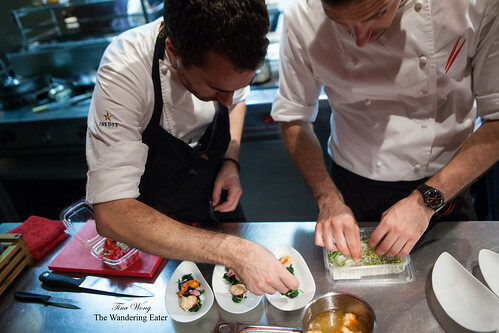 This restaurant presents an interesting and good interpretation of Japanese-Asian cuisine through the Spanish lens and you will have a good time and eat well.